​​Providing breast milk is one of the best things you can do for your baby's health and development. 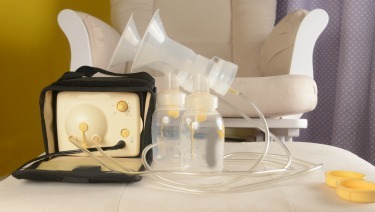 Pumping your milk is one way to provide breast milk to your baby. However, germs can grow quickly in breast milk or breast milk residue that remains on pump parts. Following these steps can keep your breast pump clean and help protect your baby from these germs. Clean if using a shared pump. Clean pump dials, power switch, and countertop with disinfectant wipe. If milk collection container will be stored at a hospital or child care facility, add name to the label. Wash. Place disassembled pump parts in dishwasher. Be sure to place small items into a closed-top basket or mesh laundry bag so they don't end up in the dishwasher filter. If possible, run the dishwasher using hot water and a heated drying cycle (or sanitizing setting); this can help kill more germs. Clean wash basin and bottle brush. If you use a wash basin or bottle brush when cleaning your pump parts, rinse them well and allow them to air-dry after each use. Consider washing them every few days, either in a dishwasher with hot water and a heated drying cycle if they are dishwasher-safe, or by hand with soap and warm water. Sanitize. Sanitize the pump kit, bottle brushes, and wash basins using one of the following options. Check manufacturer's instructions about whether items may be steamed or boiled. Steam. Use a microwave or plug-in steam system according to the manufacturer's directions.